Guess Which BBQ Celeb Doesn't Eat Their Own BBQ? 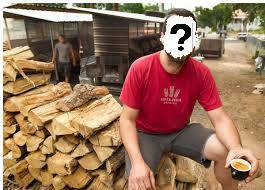 Guess Which Celebrity King of Barbecue Doesn't Eat His Own Cooking? Barbecue for the masses is a meal taken 3 or 4 times a year. But barbecue for the insiders is a sacred institution one to be cherished and nurtured for all it's worth. In the barbecue world where trophies sometimes are as big as the pit used for smoking one thing has always rained supreme. It was a given that every bbq cook and pitmaster ate their own cooking. But wait now we find some earth-shattering news about one of the largest and well-known barbecue aficionados out there. Hang on to your bbq tongs it's gonna be a bumpy ride. Taken from a profile first placed in Esquire magazine on the life and times of new-age Texas barbecue king Aaron Franklin, Franklin admits the truth: “I don’t eat that stuff.” And by that "stuff" he means "BARBECUE!" Franklin, in his 10th year as the owner of little bbq shop-turned-landmark-restaurant Franklin Barbecue, said he loves to cook but doesn’t eat barbecue at all. It was like hearing that Nolan Ryan sleeps at baseball games, or that Chip and Joanna Gaines in Waco really live in an RV. Fort Worth pitmaster Travis Heim, who followed the same trailer-to-treasure success path at Heim Barbecue, stuck up for Franklin.When you cook a few thousand pounds of brisket every week like we do, I guess you can get tired of it,” Heim replied. Franklin’s comment launched a frenzy on Facebook, where Austin American-Statesman writer David Thomas took umbrage that the pitmaster who won a James Beard Award with his brisket talked more in Esquire about eating North Carolina pork. Does Franklin need to stuff himself with brisket until he’s as fat as I am? Of course not,” Thomas wrote. Lest anyone think Thomas is the anti-Aaron of Texas barbecue, he writes that Franklin comes off like a great guy in Esquire and that “just about everybody who’s waited in that hours-long line” calls the barbecue the best ever. DeeAnna Krier of Baker’s Ribs in Weatherford said she understands how Franklin might be “fatigued” with barbecue. Brian and I eat our brisket most every day,” she wrote in a private online message. Franklin stayed out of the argument on social media, but you can order his ebook “Franklin Barbecue: A Meat-Smoking Manifesto”. Having run a company that makes barbecue sauces I can tell you that after the first hundred or so bottles one tends not to have the same level of desire for their own product. One thing I will tell you is that my fridge and cupboards are stocked with our delicious sauces and ketchup along with Chipotle Mayo. Much like the proverbial auto mechanic whose too tired to work on his own personal cars, we get where Franklin’s coming from but just the same I'd still eat the barbecue. Prime sources:By Bud Kennedy - Fort Worth Star-Telegram, Jake's Famous Foods By Jake Calloway Jr.